Goethe-Institut Hongkong and ifva, the flagship programme organized by the Hong Kong Arts Centre, will join hands once again for presenting the ifva Awards Media Art Category winner’s solo exhibition. Kenny Wong Chi-chuen, will present a series of works from 2016 to present, which places the focus on revealing his artistic practice and exploration of motion and its interpretation, by using computational kinetic sculpture to compose movement that shifts relentlessly in-between rhythmical equilibrium and unbalanced emotional state. Attraction and repulsion. Constant and temporary. Deconstruction and reconstruction. We synchronize and repel with one another from time to time. Moving and unmoving can both be found in Kenny’s works. Tick tock, tick tock — the random beats of a pendulum from the kinetic sculpture dist.duo suggests a framed movement about the moment of eye contact. The crash of such hypnotized repetitive motion and the virtual images of the expressive gaze evokes a mounting sense of tension and emotion. Similar anxiety can be seen in the unstable spinning pace of a decomposed plasma screen in Undermine. The tendency of falling, the act of breaking something down into its separate parts, and the energy created by the unbalanced rotation conjures a sense of dangerousness and uneasiness to the viewer. Subtle vibrations can create impact too. The micro movement of metal sheets in The Canvas of Resonance cultivates motion poetically and wordlessly yet triggers sounds and blurriness with our association with moving images, creating a vague container that open for interpretation. Kenny Wong was born in Hong Kong. 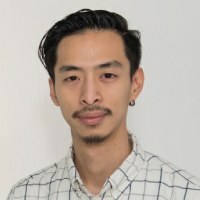 He is currently pursuing his MFA in Sculpture at Concordia University and attained his BA from the School of Creative Media, City University of Hong Kong. Kenny is also actively works as a collaborating artist, mechanical engineer/designer, and art researcher. Kenny’s works explore the delicate relationship between daily experiences and perceptual stimulations by hybridising analogue and digital representations. He is interested in searching out visual patterns, motions, and sound textures, as well as presenting works in the form of computational kinetic sculptures. Kenny has exhibited in over 10 countries, including Ars Electronica Festival (Austria), WRO Media Art Biennale (Poland), FILE Festival (Brazil) and more.